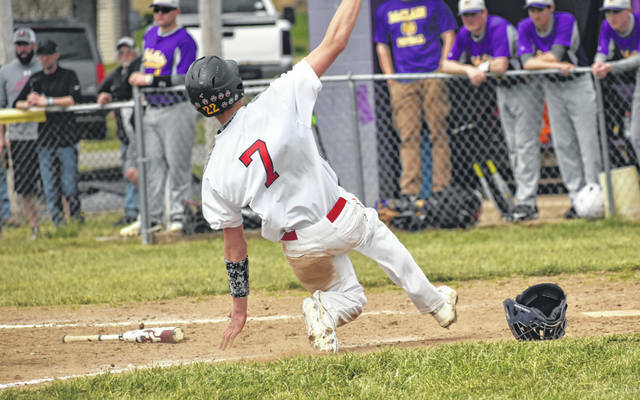 In this Times-Gazette file photo from Saturday, April 6, Fairfield’s Ethan Grooms slides across home plate at Mitchell’s Park in Greenfield where the Lions took on the McClain Tigers in a non-conference loss. The Fairfield Lions varsity Baseball team hosted the Williamsburg Wildcats on Monday at the Fairfield Baseball and Softball Complex and lost the non-conference matchup 13-9. Andrew Dingey got the start for the Lions and pitched two full innings against the Wildcats. Dingey allowed six earned runs on six hits, struck out five and walked three. Jacob Morgan relieved Dingey in the top of the third inning and pitched four innings for the Lions. Morgan gave up six hits, four runs, struck out two and walked three against the Wildcats as he picked up the loss. Griffin Irvin pitched one inning against the Wildcats, walked one batter, struck out one batter and did not allow a hit or a run for the Lions. Dan Jones got the Wildcats going with a lead off walk and Trent Kreimer singled in the next at bat to drive in Jones and give Williamsburg an early 1-0 lead on the road. The Lions had an answer in the bottom of the first inning and lead off hitter Austin Setty set the tone for the Lions with a line drive single to left field. Jacob Morgan advanced Setty to second with a sacrifice bunt in the next at bat. After a pop out by Sam Buddlemeyer Layne Morgan drove in Setty from second base with a double to center field that tied the game at one run apiece with two outs in the bottom of the first inning. Dingey followed up with a single and Ethan Grooms drove in L. Morgan and Dingey with a line drive single to center field that made it 3-1 in favor of the Lions. Irvin grounded out to short in the next at bat to end the inning. In the top of the second inning the Wildcats responded with five runs all of which came with two outs in the inning. Williamsburg’s Casey Bach drew a walk to start the inning before Morgan Bein and Max Boland struck out in successive at bats. Calib Horton then singled on a line drive to Irvin at first base and Jones followed up with a single to short that drove in Bach. Kreimer drew a walk in the next at bat for the Wildcats and Andrew McKibben followed up with a three rbi line drive double to center field that plated Horton, Jones and Kreimer and gave the Wildcats a 5-3 lead. Cameron Vaughn wrapped up the two out rally with an rbi double to right field that scored McKibben from second and pushed the Williamsburg lead to 6-3. After a quiet third inning for both teams the Lions scored three runs in the bottom of the fourth inning when Dingey doubled on a fly ball to right field that cleared the bases and scored Orrie Friend, J. Morgan and Buddlemeyer to tie the game at 6-6 after four innings of play. Williamsburg again had an answer to the Lions rally as they scored two runs on a two rbi double by Moore that plated Vaughn and McKibben to make it 8-6 before the Lions recorded three straight outs to end the threat. Buddlemeyer got the Lions within one run in the bottom of the fifth inning when he reached on an error that allowed Wyatt Willey to score and make it 8-7 in favor of the Wildcats before Friend was put out trying to advance to home. The Wildcats added two runs in the top of the sixth inning one on an error by Willey that allowed McKibben to score and the second on a wild pitch that allowed Kreimer to score and make it 10-7 in favor of the visitors on the scoreboard. Fairfield scored it’s final two runs of the game in the bottom of the sixth inning when Irvin recorded an rbi double that plated Dingey and Grooms scored on a wild pitch in the following at bat to bring the score to 10-9. Bein, Boland and Horton all scored in the top of the seventh inning to provide the final 13-9 score in favor of the visiting Wildcats.